I found male flowers last year in fields that were started with clones from female mother plants and with transplants started from feminized seed. 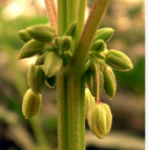 Here is a good video from Humboldt Seed Company that shows how to check for male (or hermaphrodite – both male and female) plants when they start flowering. 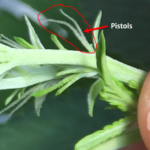 What he refers to as the “hairs” are the pistols of the female flower.